Yes, you read that headline right. I have written in a spiritual journal for more than 43 years. And yes, I have them all. I haven’t caught up with my great aunt Anna yet – I have her diaries from more than 60 years. Quite a treasure that I featured in this blog post. I reached high on the top bookshelf this past week and brought down my first three journals. To be honest, my 43 years have not been consecutive but since 1985 I have written every year – that alone is 34 years – still amazing to me. My first journal is dated January 19, 1976, married but pre-kids and I wrote about 5-6 entries. The following year I wrote 4 times in early 1977 as I was expecting my first child. Wish I recorded more during this key life-changing time of life – one of my key lessons. In 1985 I began the regular practice of writing about my spiritual journey in a journal – averaging 2-3 times a month. Interesting lessons emerged as I strolled backward through time. I wish I had started sooner and wrote more often and didn’t skip years of not writing. I read the other day this statement “I don’t want to do it, but I know it is important, so I am going to do it anyway.” Now the speaker was referring to exercise and healthy eating, but this could also apply to any spiritual practice or hitting the snooze alarm one more time instead of getting up for time with God. Journaling has been lifegiving to my heart and spirit – it is important for my spiritual well-being. I am going to keep writing in my journal – it is an essential practice for my spirit. As I reread those pages, I am glad I was open and honest in what I was experiencing. I shared this also on this blog post. I fully expect my children to read about my life in my journal someday and hope they hear and honor my story. Seeing those words once again brought joy, tears, sadness, and bittersweet memories that were long forgotten if they hadn’t been recorded. I am reminded that I have survived 100% of my worst days so far which gives me hope for the future. I wrote about my dream to be a writer in 1986 and have collected a wealth of ideas of subjects to write about since then. I must comb these pages for illustrations, stories, wisdom that could be used in stories, books and talks. I didn’t begin my annual review process and “harvesting my journal” until 1994 but so happy to find these yearly summaries and turning forwards into a new year. I did notice I highlighted many passages back in the ’80s. I see patterns of desires and behaviors and the birth of interests that bear fruit often years later. Reviewing our journal yearly or every 10 years or like this, even 40 plus years later is revealing. 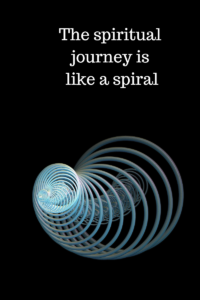 My biggest lesson is spiritual growth is spiral. We don’t just “accomplish” a God- assignment and move onward. “Got that learned and checked off my list, God – let’s move on.” Like the spiritual shuffle I mentioned a few weeks ago, we slowly come back to many of the same issues – sin, loving God with our whole hearts, minds, and spirit, discernment, hearing God, family issues and celebrations, etc. over and over again but see them at a new perspective or level on the spiral. I wrote in 1986 “Fear should not make my decisions” and re-learned that lessons again in 2019. God continues to shape us and we continue to learn and relearn – thank you, Lord, for forgiveness and patience! Our life unfolds its deepening layers and is a process, not an accomplishment. 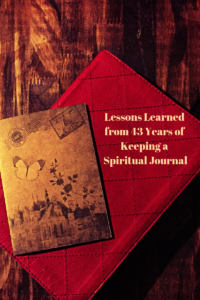 The practice of writing in a spiritual journal connects me with God, reminds me of his ongoing presence and guidance, and grounds me in the reality of who I am and who I belong to. My biggest emotion rereading these treasures? Gratitude! Thankful for life, for family and friends, for memories that add color, and most of all to God. Do you write in a spiritual journal? How has this practice formed you?